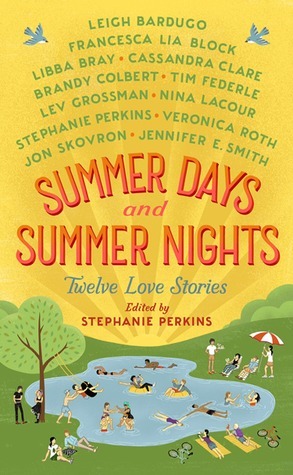 I adored the winter themed short stories that Stephanie Perkins edited by some huge names in Teen lit in My True Love Gave to Me, so it was a no-brainer picking up the newest, summer themed, collection. Teen love stories...sigh. They're my reading go-to, especially during the summer. I even took a break from my fascination with "space fiction" to read this! The themes, plots, and characters definitely varied from author to author, and it was no surprise to me that some of my favorites were by authors I adore. I found a few new authors to investigate as well which is always exciting. If you're looking for a light, fun read filled with romance, this is an ideal book to pick up at your local library! "Head, Scales, Tongue, Tail" by Leigh Bardugo : When a girl sees a creature in a local lake, her world changes forever. Loved the romance that blossomed from an unexpected friendship and elements of lore weaved throughout. "Last Stand at the Cinegore" by Libba Bray : This one had me at Libba Bray, but the story was also hilarious and creative. A local movie theater that shows horror movies is going out of business, so as a last hurrah, the theater owner decides to show the last copy of a movie believed to be cursed. Too bad for Kevin, a curse is the last thing he needs as he tries to muster up the courage to ask Dani out. 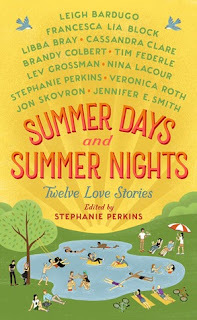 "In Ninety Minutes, Turn North" by Stephanie Perkins : A continuation of Perkin's tale in the early compilation. After meeting one fateful night in December, Marigold and North find their lives moving in different directions. "Inertia" by Veronica Roth : I'm not a huge fan of Veronica Roth, but this short story surprised me a bit. It's a bit tragic, a bit sad, but kind of beautiful in the end. Claire has been requested for a Final Visitation, a sharing of memories before her best friend undergoes a surgery that he might not survive. "Good Luck and Farewell" by Brandy Colbert : After the death of her mother, Rashida became very close with her cousin Audrey, but now Audrey is moving across the country with her girlfriend Gillian, and Rashida feels the loss all over again - until she meets Gillian's brother. "Brand New Attraction" by Cassandra Clare : Also not a big fan of Cassandra Clare, but I loved the setting of her creepy carnival powered by demons. Lulu's father, and the operator of the carnival, has disappeared, and her uncle has come to bring the carnival back to it's former glory, but there's a high cost associated with working with demons. "A Thousand Ways This Could All Go Wrong" by Jennifer E. Smith : I keep meaning to read more by Jennifer E. Smith, but I never quite get to her books. This was an adorably sweet story about Annie and Griffin - a girl with a crush and a boy with asperger's trying to find ways to show her he cares.